Get ready to feel all of the feels. There’s something beautiful about the moment a bride takes her groom’s breath away at the altar, especially when he’s overcome with emotion and joy. One recent wedding moment in particular is dominating our Instagram feeds. Proud groom Chuck Caughmanjust couldn’t keep his compusure as he began to pledge his life to his new wife, Teri Michelle Caughman, and exchange vows. Chuck began to give his personal vows but got choked up as he shared how much his bride meant to him. 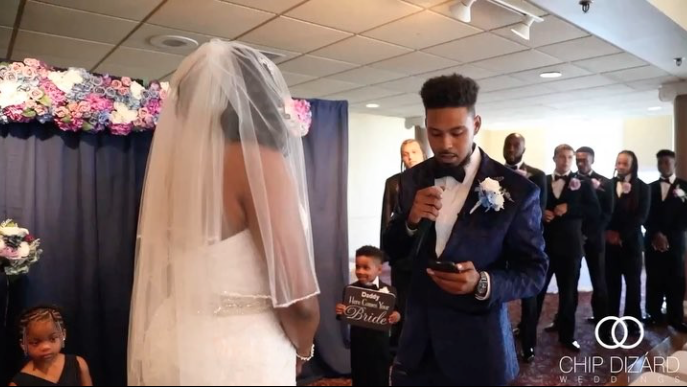 The must-see moment was captured by Chip Dizard Weddings and had the Internet all in their feelings.